"Only 15 minutes after I installed an MN 325, I suffered a total power failure and the unit worked as advertised. Talk about timing! I haven't had any other power failures since, but I know that if I do I'll be protected." The SSL-EMD (Environmental Monitoring Device) is a connectivity device that allows you to remotely monitor the temperature, humidity, and status of two contact devices. Through the SNMP-SSL card, the user can monitor it and receive notifications of the alarms. When the SSL-EMD is plugged into the SNMP-SSL card’s COM port, temperature and humidity readings are automatically displayed on the SNMP-SSL card’s “Comprehensive View” page. If enabled, the status of the external contact device is also displayed on the same page. SSL-EMD provides real-time temperature and humidity monitoring. Monitors the status of two contact devices to protect your critical equipments. Can be located 15m away with a straight-through CAT5 network cable. User selectable alarm thresholds allow you to define acceptable temperature or humidity limits. Environmental management and flexible configuration via Web Browser. Automatic events notification via email and SNMP Traps. Regularly records SSL-EMD parameters for statistical analysis. Environmental temperature and humidity monitoring. Attaches up to 2 contact closure inputs for monitoring other environmental devices. 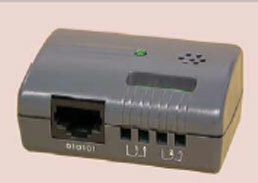 Allows remote monitoring through network. Monitor temperature and humidity, program alarms, & more, from a single screen.